Is your application, server, or service delivering the appropriate speed of need? How do you know? Are you 100-percent certain that your latest feature hasn’t triggered a performance degradation or memory leak? There's only one way to verify - and that's by regularly checking the performance of your app. But which tool should you use for this? In this blog post, we'll review the pros and cons of the leading open-source solutions for load and performance testing. We’ll cover the main features of each tool, show a simple load-test scenario, and display sample reports. At the end, you'll find a comparison matrix to help you decide which tool is best for your project. Just as a short note, if you are looking for a way to automate these open source tools, BlazeMeter created Taurus, our own open source test automation tool that exends and abstracts most of the above tools (as well as Selenium), and helps to overcome various challenges. Taurus provides a simple way to create, run and analyze performance tests. Make sure to check it out. For our comparisons we will use a simple a HTTP GET request from 20 threads with 100,000 iterations. Each tool will send requests as fast as it can. The Grinder Console - This GUI application controls various Grinder agents and monitors results in real time. The console can be used as a basic interactive development environment (IDE) for editing or developing test suites. The Gatling Project is another free and open source performance testing tool, primarily developed and maintained by Stephane Landelle. Gatling has a basic GUI that's limited to test recorder only. However, the tests can be developed in easily readable/writable domain-specific language (DSL). If you are interested in more information about Gatling, view our on-demand webcast Load Testing at Scale Using Gatling and Taurus. Tsung (previously known as IDX-Tsunami) is the only non-Java-based open-source performance-testing tool in this review. Tsung relies on Erlang, so you’ll need to have it installed (for Debian/Ubuntu, it’s as simple as "apt-get install erlang”). Tsung was launched in 2001 by Nicolas Niclausse, who originally implemented a distributed-load-testing solution for Jabber (XMPP). Several months later, support for more protocols was added and, in 2003, Tsung was able to perform HTTP Protocol load testing. Today, it’s a fully functional performance-testing solution with the support of modern protocols like websockets, authentication systems, and databases. Apache JMeter™ is the only desktop application in this review. It has a user-friendly GUI, making test development and debugging much easier. The earliest version of JMeter available for download is dated March 9, 2001. Since then, JMeter has been widely adopted and is now a popular open-source alternative to proprietary solutions like Silk Performer and LoadRunner. JMeter has a modular structure, in which the core is extended by plugins. This means that all implemented protocols and features are plugins that have been developed by the Apache Software Foundation or online contributors. Scalable. When you need a higher load than a single machine can create, JMeter can execute in a distributed mode, meaning one master JMeter machine controls a number of remote hosts. Locust in a Python-based open source framework, which enables writing performance scripts in pure Python language. The main uniqueness of this framework is that it was developed by developers and for developers. The main Locust targets are web applications and web-based services, however, if you are comfortable with Python scripting, you can test almost anything you want. In addition to that, it is worth mentioning that Locust has a completely different way to simulate users, which is fully based on the events approach and gevent coroutine as the backbone for this process. This process allows simulating thousands of users even on a regular laptop, and executing even very complex scenarios that have many steps. 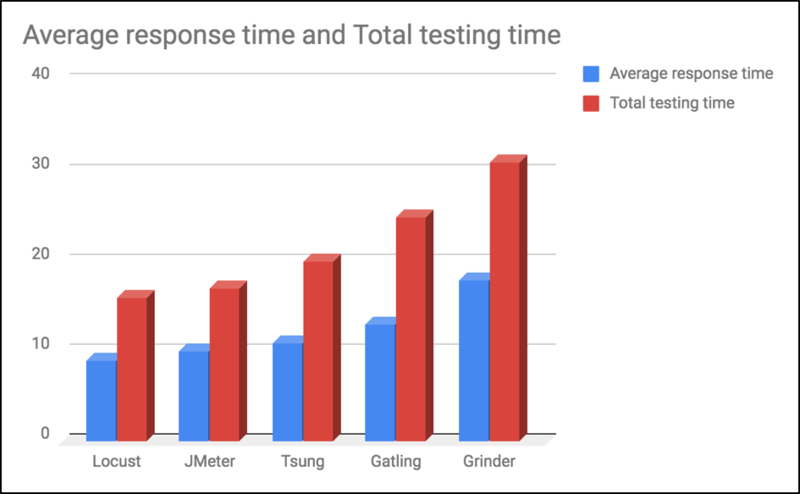 • Simple Scalability – It’s easy to create large-scale JMeter tests. You can run far larger loads far more easily with BlazeMeter than you could with an in-house lab. • Rapid-Start Deployment – BlazeMeter’s recorder helps you get started with JMeter right away, and BlazeMeter also provides complete tutorials and tips. • Web-Based Interactive Reports – You can easily share results across distributed teams and overcome the limitations of JMeter’s standalone UI. 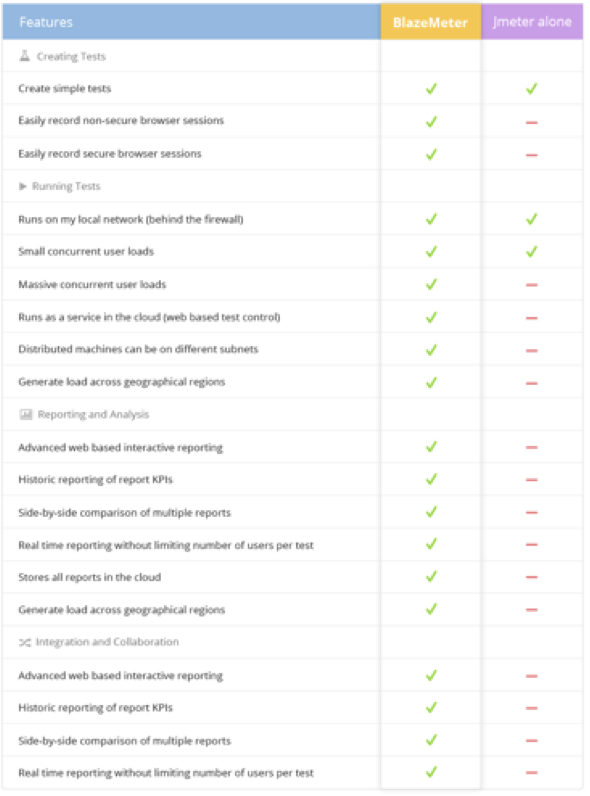 • Built-In Intelligence – The BlazeMeter Cloud provides on-demand geographic distribution of load generation, including built-in CDN-aware testing. 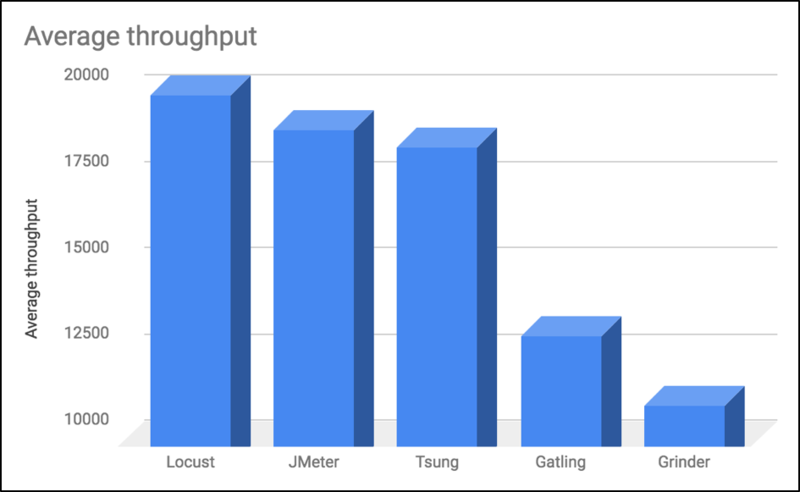 As shown in the graphs, Locust has the fastest response times with the highest average throughout, followed by JMeter, Tsung and Gatling. The Grinder has the slowest times with the lowest average throughput. Python knowledge required for test development & editing. Reports are very plain and brief. Scala-based DSL language knowlegde required. Tested and supported only on Linux systems. Bundled reporting isn’t easy to interpret. Python knowledge required for test development & editing. Want to find out more about these tools? Log onto the websites below - or post a comment here and I’ll do my best to answer! As I mentioned at the start, you might also want to read more about Taurus. When it comes to performance testing, a lot of these are really great...but not perfect. Automation and integration with other systems can be a pain, and the tool itself comes with a steep learning curve. Taurus is an open source test automation tool that provides a simple way to create, run and analyze performance tests. Want to Learn More About Load Testing With Open Source Tools? Do you have questions about open source testing tools? View our webinar Ask the Expert: Open Source Testing with JMeter, Gatling, Selenium, and Taurus. This special interactive presentation and Q&A was hosted by Andrey Pokhilko, founder of JMeter-Plugins.org, a core JMeter contributor, and creator and lead developer on the Taurus project. Do you want to try out JMeter? Learn for free from our JMeter academy. Start testing now! To try out BlazeMeter, which enhances JMeter features, request a demo, or just put your URL or JMX file in the vox below and your test will start in minutes. To run Locust, Gatling, The Grinder and Tsung automatically and more easily, try out Taurus. The parts about Locust were contributed by Yuri Bushnev.